One of the things I wanted to do on my month-long trek across the United States was visit some national parks. Top on my list was Arches National Park in southern Utah. While I lived and worked in Utah for over ten years, somehow I never managed to visit this picturesque national park with its iconic 65-foot tall freestanding natural arch near Moab. I naturally found plenty of lesser known places to explore throughout the state, but before I knew it I had moved away without ever having experienced life at this spectacular place featured on Utah’s license plates and visited by travelers from around the world. It’s ironic that I would now venture over 2000 miles from home to visit a place that was once only a four-hour drive from where I lived. I planned to be at Arches for two days of camping by Sept. 30. A car breakdown in Wyoming (another story for another time) delayed my arrival and the next day the United States closed its national parks in response to a government shutdown. It’s important to mention that while the closure of national parks is an inconvenience to travelers like myself, that there are far more serious consequences from the government shutdown that have affected people’s health care, income and employment, including some of Uncharted’s own. Our thoughts go with all those who are affected adversely by this difficult situation. We hope it will soon be resolved. But, if you find yourself in a situation where the closure of a national park is affecting your travel plans and you’re not brave enough to sneak in, you might consider some really cool state parks. Utah’s governor recently requested that its state parks honor National Park Service passes during the federal government shutdown. The passes are valid for day-use only. Utah has also published a very helpful travel advisory with plenty of state-run alternatives to closed national parks. Since I was in Utah during the first part of the shutdown, I decided to visit a place I once frequented while working as a newspaper photographer but had never really had time to thoroughly explore. Antelope Island State Park on Antelope Island in the Great Salt Lake is open year-round and offers camping, biking, boating and mountain biking. It’s also a great place to view wildlife including a herd of over 500 bison, some Pronghorn antelope, coyotes, badgers, bobcats, hawks and falcons. After several hours exploring the island, I saw a bison walking slowly across a dry patch of the Great Salt Lake normally covered by water. 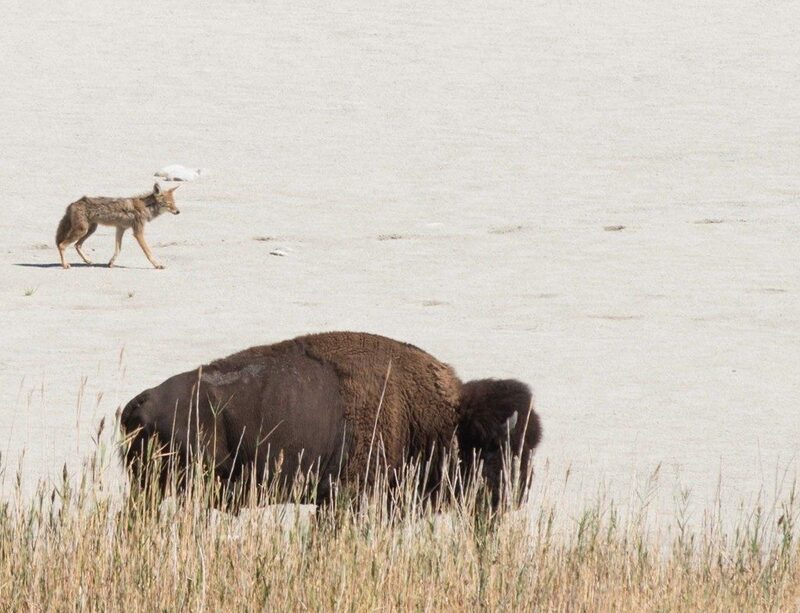 A few moments later, a scrawny coyote creeps out from behind some brush and stealthily trails the bison. Something else startles it and it runs back into hiding. It’s not a national park, but Antelope Island State Park is open and it’s a great alternative to the many national parks now closed. Alan Murray is Uncharted’s President and one of it’s co-founders who still hasn’t been to Arches National Park. To learn more about Uncharted and the new online exploration community we are building, sign up and we’ll let you know when it’s ready so you can share about your own adventures.